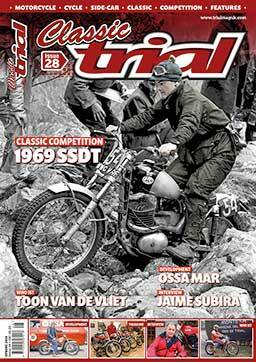 The SSDT ran from 4th – 9th May. With all the arrangements in place I headed to Fort William, Scotland for the event’s proceedings. With Nick in fine form and ready for action we checked that all the machines had arrived. The days and machines are as follows: Monday – Scorpa 250cc SYF four-stroke; Tuesday – Beta Evo 250cc 2T; Wednesday – Gas Gas 280cc TXT Pro; Thursday – Xispa 250ccR; Friday – Sherco 250cc; and finally Saturday with the 250cc Montesa 4RT. A superb selection of machines and for me a good one as the week began and ended with a four-stroke machine. With all the machines lined up and ready for the off I was quite excited that the whole project had come to life. Nick would ride the Scorpa in the parade through the streets of Fort William before putting the machine into Parc Ferme on the Sunday, where it would stay until the start of the Trial in the morning. After a good soak in the bath on Wednesday night it was down into the restaurant at the West End Hotel for some well-earned food. Sat looking out of the window we watched as a force ten gale blew up Loch Linhie. Soon there were scenes of commotion as the wind began to blow the tents and awnings over in the car park opposite where the Trial is stationed for the week. It lasted for about ten minutes before the storm passed over. This did not look good for Thursday’s tough day ahead. Soon word got around that the route for Thursday would be much shorter and based around Kinlochleven; phew! The course plotting team led by Rab Patterson had decided it would be too risky to send the riders out onto Rannoch Moor the following day and so the clerk of the course Mark Whitham and his band of helpers had to start planning a new route at eight thirty in the evening. On Thursday morning it was announced that the riders would leave the start in pairs at minute intervals starting at ten thirty. I went into Parc Ferme and got the Xispa out to adjust the controls to my liking. 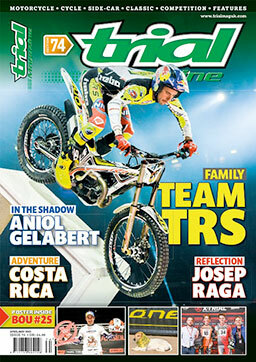 As you are all well aware the Spanish machine is new to the trials scene and I looked forward to riding something totally new. The machine fired up with no problems at all, with good news that today’s route would be only fifty miles based around Kinlochleven. As I headed out of Fort William towards the Mamore road it was obvious the machine was not suited to being pushed on the road as the gearing was way too low; this was also echoed on the tracks and moors as the day progressed. In the sections the front of the machine felt very stable if not a little low resulting in the steering feeling quite heavy, but maybe this was just a personal thing. The front suspension was fine but the rear was not for me at all, maybe it needed setting up better as the damping was virtually non-existent. For example at the famous Pipeline sections the machine ran well and I felt confident on it but the rear shocker literally bottomed out and bounced its way up the section. The machine feels as though it just wants to be developed, as if its full potential has not yet been realised. The gearing would cost me a few more marks, as I wanted to go faster than the machine would, though the carburetion was quite clean and the performance of the engine overall was quite good. Small things spoil what potentially could make a good machine. Towards the end of the day a small amount of water had found its way into the air box; this probably found its way in through the vents around the seat area. A little more thought and this problem could be eradicated. On the ride back to the finish at the end of the day my thoughts turned to how this new machine could be improved? All it really needs is some more development and the quality of the components improving; maybe an area the factory could work on to improve what is basically not such a bad machine. Disliked: Front and rear suspension.